During fiscal year 2017 the Prairie Studies Initiative (PSI) has continued on-going projects such as the Meadow and the hosting of the annual Tall Grass Artist Symposium, and undertaken new ones as well. Touch the Prairie, an interactive touch screen that links prairie-related artworks in the museum’s collection with natural science information about the prairie ecosystem, has taken on a double life. Programmer/artists Rose Marshack and Rick Valentin were able to further develop Touch the Prairie for installation on a large upright mobile touch screen. The creative work and equipment purchase were made possible by a gift from Jackie Hartman Borck and Lee Borck. The mobile touch screen was unveiled April 1, 2017 on the occasion of K-State Open House, and is now available to visitors in the museum’s galleries. We hope you will check it out on your next visit to the museum. The touch table, its original platform, will ultimately return to the Department of Landscape Architecture/Regional and Community Planning. Before that, the interactive table will spend the academic year 2017-18 at the offices of the Kansas Board of Regents in Topeka as part of a display titled “Artistry and Innovation” representing the creative cross-disciplinary work of Kansas State University. A suite of six high resolution photographs of prairie plants with their exceptionally long roots by Lindsborg-based photographer Jim Richardson has become part of the museum’s permanent collection. Two of these prints were part of the reinstallation of the permanent collection, opened last fall as part of a celebration of the 20th anniversary of the Marianna Kistler Beach Museum of Art. In May the museum took the lead role in submitting a proposal to the National Endowment for the Arts titled, “What can the arts teach us about communicating STEM content?” Associate Professor Shreepad Joglekar of the department of Art and I serve as co-principle investigators. The Salina-based Land Institute is our required non-arts partner organization; key support for the proposal comes from Todd Holmberg, executive director of McCain Performing Arts, and Dean of Libraries Lori Goetsch. The strong place-based and cross disciplinary focus of proposal activities make it an exciting next step for PSI. Fingers crossed! This post is part two of a two part blog series, “Wondering about Meaning” written by the Director of the Marianna Kistler Beach Museum of Art, Linda Duke. Information overload affects artists, too. Some of the best new work evidences that artists have searched for meaning in the onslaught and employed their skills in sorting through dense information and making sense of complexity and ambiguity. 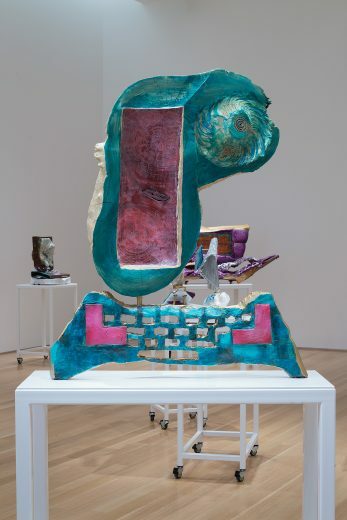 Consider this work of art in the collection of the Marianna Kistler Beach Museum of Art: Dendrochronological Data Sequences by Andrzej Zielinski, a sculpture that evokes a computer keyboard and screen in a brightly colored “head comics” sort of style. Careful examination reveals that the “screen” is an actual cross-section slice of a tree or, rather, of three trees that have grown as one, each with a core and concentric annual growth rings. Tree rings are well known to record the effects of climate conditions. It may therefore dawn on the viewer, especially after reading the title the artist has given this work, that two modes of data storage are referenced here: the one recorded and preserved in the natural growth of trees since that botanical life form evolved on Earth, and the one employed by the hard drive of an early 21st c. computer. Andrzej simply presents us with this observation, in a material object constructed with meticulous craftsmanship that may be overlooked because of its playful form. The artist juxtaposes two means of data storage and two assumptions we may make about objects, the latter being that a humorously distorted form carries no serious meaning and that classic material techniques such as bronze casting, marble carving, and gilding would be employed only in a serious-looking sculpture. In their artworks artists juxtapose the most baffling data points and toss to us, as viewers, intriguing hints and inspiring possibilities instead of burying us in didactics and rationales. They give us experiences and visions to unpack. In doing this, they continue an important and age-old function of art. They help us to understand our lives and the realities we experience. They encourage us to sense who we are. They suggest to us that the answer to “Who am I?” is never final. It grows and changes as we encounter the messy, complex, and confusing world around us. It’s an ongoing calculation of this plus those minus that. It’s worth wondering about.